Backed by Toyota’s high reputation for quality and value, this year’s 2016 Toyota Highlander highlights a wide selection of powertrains, adjustable second-row seats, and stress-free third-row access. This latest Highlander offers both V6 and four-cylinder engines, along with front and automatic or all-wheel drive options for a fuel-efficient drive. It’s also packed with safety features including eight airbags, a standard rearview camera, and Hill-start Assist on all models. The Highlander comes with many standard high-tech components like Bluetooth and Toyota’s Entune smartphone connectivity. This family-friendly SUV offers a prominent three-row vehicle for up to eight people. And it carries on as a versatile and good-looking minivan choice. 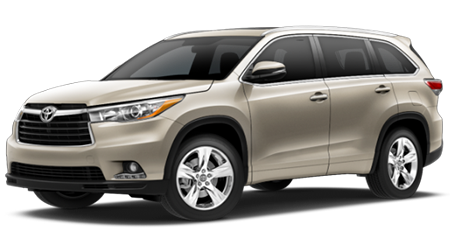 See the Toyota Highlander and take it for a test drive here at Lipton Toyota in Fort Lauderdale, FL. Our friendly staff is standing by and ready to welcome our neighbors from Dade County and Broward County, FL. The Toyota Highlander LE includes standard premium cloth interior, Bluetooth, 18-inch wheels, Toyota's Entune smartphone connectivity, a USB port, and a rearview camera system. The LE trim also showcases split-folding second- and third-row seats for flexibility. For the Highlander LE, there's an LE Plus Package, which injects satellite radio capability, power driver's seat power tailgate with flip-up glass, and three-zone climate control. Options for the 2016 Highlander XLE include a Blu-Ray DVD entertainment package and captain chairs (which will replace the second-row bench seat). A Limited Trim is offered with the standard V6 engine. Highlander Limited models include 19-inch wheels, second-row captain's chair, a blind-spot monitoring system, heated and ventilated front seats, rear parking sensors, premium audio, and a power front passenger seat. A sunroof is an individual option. For the Highlander XLE and Limited trims, a scheme called Driver Easy Speak employs a microphone to pipe front-seat voices to back-seat occupants—making interaction with third-row kids so much easier and calmer. For those who desire first-class all the way, choose the Limited Platinum Package. The Limited Platinum includes the Driver Technology Package (Automatic high beams, pre-collision with Dynamic Radar and Safety Connect, Lane Departure Alert, and Cruise Control); a heated steering wheel, heated captain's chairs, rain-sensing wipers, and a panoramic sunroof. For 2016, all Toyota Highlanders with V6 engines include the Towing Package, which assumes up to a 5,000-pound pulling proficiency. This phenomenal hauling bundle features a 200-watt fan coupling, a 150-amp alternator, a heavy-duty radiator, engine oil cooler, and transmission oil cooler. 2016 Toyota Highlander imbues a four-cylinder or V6 engine choice with a selection of front-wheel drive or all-wheel drive for most of the models (see separate page for Hybrid edition). All Toyota Highlanders are fuel-efficient -- whether you need to run errands around town -- or you’re driving cross-country to visit friends and relatives. The standard 2.7-liter four-cylinder motor comes synchronized with a six-speed automatic transmission and is offered only with front-wheel drive. It produces 185 horsepower and 184 pound-feet of torque for a smooth ride. Most Highlander editions arrive outfitted with the 3.5-liter V6 engine that creates a brawny 270 horsepower and 248 pounds-feet of torque. It’s paired with a six-speed automatic transmission, but can be paired up with either with front- or all-wheel drive. It’s a fuel-efficient, reliable, and strong choice. For 2016, all V6 (non-hybrid) engine driven Highlander editions includes a towing package that gives them 5,000 pounds in towing capacity. The four-cylinder models allows up to 1,500 pounds. The 2016 Highlander highlights Hill-start Assist, a standard rearview camera, and eight airbags. Excellent external visibility is another exceptional feature in this latest generation of the Highlander. This year’s Highlander also offers cutting-edge safety options including parking sensors, blind-spot monitors, and a lane-departure warning system. A Driver Technology Package inserts cruise control and a pre-collision warning system. 2016 Toyota Highlander’s independent-rear and front-strut suspension presents a remarkable response handling that makes this vehicle a treat for drivers. It’s the perfect family wagon whether you’re dashing through the city or you’ve set out for a long highway vacation. The 2016 Toyota Highlander promotes a comfortable ride, plenty of room for people as well as cargo, and a full list of high-technology safety features. You’ll get solid customer service and our incredible price when you purchase a reliable, Toyota Highlander at Lipton Toyota in Fort Lauderdale, FL. Be one of the first in Dade County or Broward County, FL to own this handsome family-friendly vehicle.